The classic Disney animated TV series DuckTales celebrates its 30th Anniversary this month. And while there is a new reboot on the horizon, which has a slightly reworked theme song, a new rock-metal cover has arrived to help fans party down on the popular show's birthday. And it is as irresistible as any version of the theme song yet released, whether it is barn yard animals humming the tune, or little kids getting the lyrics wildly wrong. Disney' Ducktales made its debut on September 18, 1987. And it brought the classic characters Scrooge McDuck, Donald Duck, and his nephews Huey, Dewey and Louie to the small screen for some Indiana Jones inspired adventures. It helped shape the millennials we know today, for both good and bad. And there isn't one of them alive right now who don't automatically know this song as soon as it kicks off in its signature style. Ducktales undeniably has one of the catchiest theme songs ever written for any TV show, whether it be animated or live-action. Mark Mueller created the original song, giving show creator Carl Barks' characters and stories a kick that immediately pulls the audience in for the ride every time. And it's evergreen. It just never grows old. It speaks volumes that Mark Mueller's original tune is being kept mostly intact for the upcoming remake coming to Disney XD. We still have a few weeks before that begins airing regularly, so this rock-metal cover comes as a nice treat in the interim. As it captures the spirit of the original while giving it a decidedly twisty spin. Jonathan Young has been having a lot of fun with theme songs and creating new music for fan favorites. Though, this cover of Ducktales is a little hard to classify with its hipster vibe. Some will get a kick out of watching Young perform the song, as he's thoroughly enjoying the experience. The Donald Duck hat, procured at Disneyland, is a nice touch, too. The first two episodes of the Ducktales reboot premiered on Disney XD last month, and fans have been quite happy with the outcome, clamoring for more. The animation style takes some adjusting, as it looks stylistically different from the original. Something had to set it apart, right? But the stories and characters feel like Barks classic take on the material. And Donald Duck has much more of a role to play, which is making some fans extremely happy. 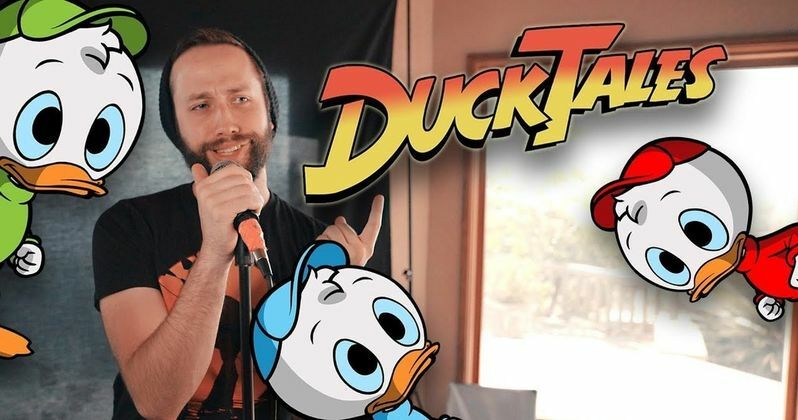 Felicia Barton sings the show's new rendition on the DuckTales theme. And the pilot episode even paid homage to the original with it's show title Woo-oo! New episodes officially begin airing on Disney XD starting September 23. You can find more from Jonathan on his Young Youtube Channel. He promises a new music video 'every dang week'. He previously covered Eye to Eye from the Goofy Movie and has done a cover of the Attack on Titan theme, which is much more metal than what we have here.